Thanks! Yeah, I updated the thread with this new section. I've been working out how small groups can gain the leverage they need to be effective versus the large zergs. I would love to see people to put this into practice and hear how it went. Great job. This article is very informative and easy to read. What do you do when your map is completely controlled by the enemy and you have no hope of taking and holding an objective? You call in the Tarnished Coast (or Piken Square!) Navy SEALS. The plan below shows something I did today with a group of five players in the Sorrow's Furnace Borderlands. We could not capture a single supply camp because we had too few players and Anvil Rock was not putting up much of a fight. Sorrow's Furnace was owning us both. So I put out a call in chat to form a Navy SEAL team that would do hit and run with amphibious assaults. IT WAS A BLAST! We traveled using the waterways to suddenly emerge out of nowhere to destroy dolyaks, sentries, and unsuspecting enemy players. 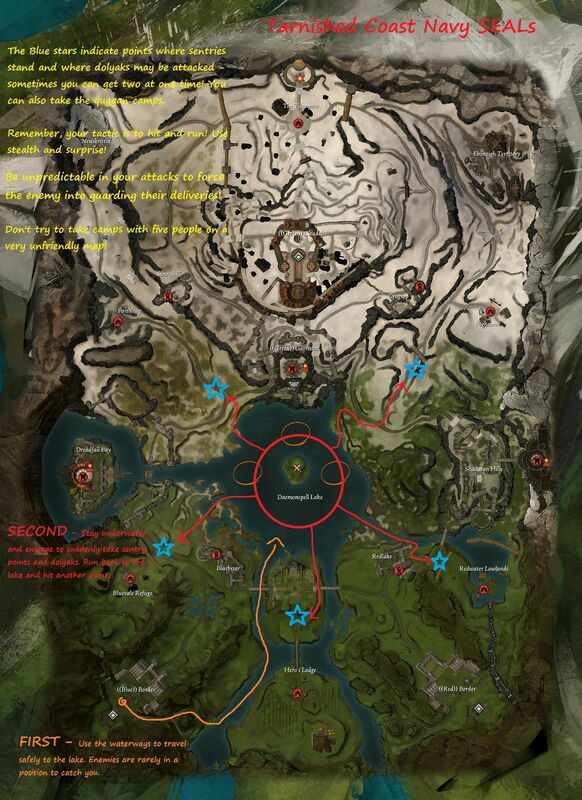 We would run back underwater and take the quaggan camps while we watched for approaching caravans on the map. After about an hour of these attacks, every caravan was guarded by enemy players, but that also pulled them away from the southern objectives to allow our server and Anvil Rock to start retaking objectives in front of their spawn points. We were getting a ton of XP and we had to go back to the spawn point because our bags were so full of stuff we looted off dead players and NPCs! The best part was that we didn't feel so helpless because we were outnumbered. We felt like badass Navy SEALs and we were being proactive where we had no chance of winning a direct fight with their huge zerg. So next time, when the odds are bad and the map is dangerous for normal forces, form your own Navy SEAL squad and start making a comeback.! HOO-RAH! Thank you glaucon. A very good read and some sound tactics for fledgling commanders and group leaders.